I revealed my son Everett’s vintage modern nursery a few weeks ago, and I promised I’d share with you how I DIY’d a custom upholstered end panel for the crib. And mamas, if you want to add the perfect finishing touch to your baby’s crib, this is the project for you. It’s super easy, it only took an afternoon to complete, and it added a whole lot of character to the space. It’s the perfect way to layer a pop of color or pattern into the nursery, and plus it gives the crib a really beautiful, polished look. I started with a pretty two-tone convertible crib. 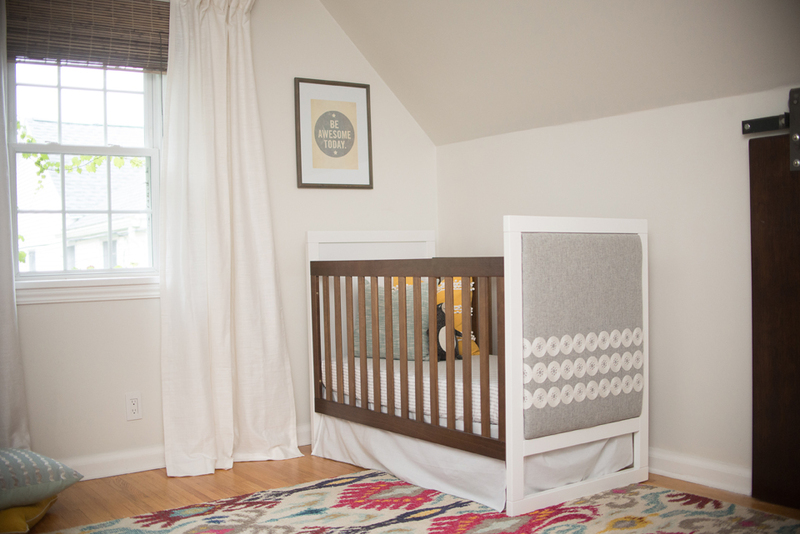 I loved how the white end panels gave the crib a crisp, modern look that contrasted with the vintage elements in the nursery, and the rich walnut stain just added to the warmth of the space. But I’m never one to leave things as is without infusing a little bit of my own style (much to my husband’s dismay), and after assembling the crib and putting it in place in the nursery, that white end panel was calling my name. I started brainstorming ways to add a custom touch, and when my search for the perfect patterned curtains for the space came up short, it dawned on me. I could layer in the pattern I was craving by making my own upholstered end panel for the crib. Cut the plywood to fit the end panel of your crib (or have it cut to size at your local hardware store). If the panel on your crib is recessed like mine, make sure to leave a gap of about 1/4″ around the plywood to account for the width and length that the batting and fabric will add. Apply spray adhesive to one side of the plywood and one side of the foam. Carefully lay the plywood on top of the foam, sticky sides together. Allow time to dry based on the instructions on your spray glue. And don’t worry if the foam extends past the edges of the plywood—we’ll take care of that next. Cut the excess foam from around the plywood using a straight edge and a utility blade or Xacto knife. Lay the fabric out flat so you can cut it down to size. If it has a geometric pattern like mine, make sure to plan carefully for where it will fall on the panel. I decided that I wanted the bottom row of circles to align with the crib mattress when it’s at its lowest point, so I marked that height on the back of the plywood and then placed the plywood on top of the fabric to determine the correct placement. If the pattern will fill the whole panel, I’d recommend drawing lines at regular intervals to use as guides when you’re stapling to make sure that the pattern stays straight. Cut the fabric, leaving about six inches of excess on all four sides. Then cut the batting to the same size as the fabric. And now it’s time to assemble! Lay the fabric right side down, then layer the batting on top of the fabric and finally place the plywood (foam side down) on top of that. Double (and triple!) check that the pattern is straight and centered before you begin stapling. Starting on one side, pull the fabric and batting taut and staple to the plywood in the center. Move around to the opposite side, and again, pull the fabric and batting taut and staple. Then move to the top and then the bottom of the plywood and staple, staple, staple! After you have at least one staple on all four sides, move back to the side that you started on, and add a few more staples, working your way out from the center. Then move to the opposite side, top and bottom and staple your little heart out, adding just a few on each side before moving to the next. Remember to keep your fabric and batting pulled taut as you’re stapling, and check the front often to make sure that the pattern is straight and centered. When you’re about three inches away from each corner, fold and wrap the fabric on each side until you achieve a clean corner. I trimmed the excess batting away before stapling the corners because I found that cutting down on the bulk made it easier to do. This was by far the most challenging stage of this project for this first-time upholsterer, so just remember—it only has to look pretty on the front! After you’ve completed the four corners, trim off the excess fabric and batting, and then it’s time to apply the Velcro. I chose the industrial strength variety because I wanted to make sure that the end panel would stay put for the long haul, but it’s still removable if I ever decide to switch out the pattern. Measure the width and length of the plywood within the stapled fabric, and cut the Velcro to length. Peel, stick and repeat until all four sides are covered. And now for the moment of truth. Bring your finished upholstered panel up to the nursery, and peel the protective film off the visible side of the Velcro. Hold it up to the end panel of the crib, and when you have it aligned correctly, stick it into place. Step back, admire and then bring in your husband, your toddler, your best friend, you neighbor and your dog to applaud your handiwork. But wait! I’m not done yet—are you ready for another quick and easy DIY? After I chose this crib for the nursery, I selected a two-tone dresser that would be the perfect complement. The only problem? The stain on the dresser didn’t match the stain on the crib. What’s a girl to do? With another free afternoon, a hand sander and some matching stain (which you can have custom matched at your local paint supply store, by the way), I gave the base of the dresser a mini makeover. Here’s how I did it. If there’s anything I’ve learned, it’s to never just accept something as it is if you have the ability and the desire to make it your own. There’s always a way change it, and it’s usually easier than you think! These projects are both really simple, fast and inexpensive ways to add a custom touch that will elevate the design of the nursery. If you make your own DIY upholstered crib or customize another piece of furniture for your little one’s nursery, make sure to take photos and share them in the gallery! I’d love to see what you come up with! Products were received from Walmart, but all opinions are my own.